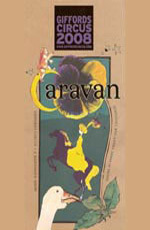 Eclectic, exhilarating and evocative, the music for Caravan pays homage to the cultural richness of the Roma. A musical extravaganza encompassing the enchantments of India through a wealth of Eastern European traditions and Celtic resonance performed by La Fanfare Suivante. 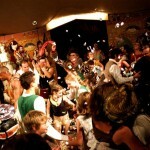 From May to September 2008 the Giffords Circus toured south England and Wales with the critically acclaimed show, Caravan, incorporating musicians, acrobats, horse people, Tweedy the Clown and jugglers from all over the world. Delighting and inspiring audiences with every show, Giffords is the most magical, intimate and dramatic circus you could ever hope to see. The show is a day at a county fair, at the turn of the last century. The gypsy, the showman, the horse dealer, the policeman, the general trader, the food vendor, country and town folk could meet bi-annually for the fair.There are jugglers, itinerant musicians, some strolling players, highlights from Shakespeare enacted in the mud and the din and the dust of the fair.